Pavlova is an elegant dessert that is named for the ballerina Anna Pavlova. The meringue base is supposed to resemble the fluffy tutu that ballerinas wear. It's easy and delicious. You can top the pavlova with anything you want, including caramel ice cream topping, crushed candy bars, bananas, cooked fruit compote, or chocolate curls, but this elegant dessert is perfect to showcase summer fruits. Read How to Make Meringues before you begin. Preheat the oven to 275°. Draw an 8" circle on parchment paper. Turn the paper over and place it on a large cookie sheet. In a large bowl, place the egg whites. Let stand at room temperature for 30 minutes. Then start beating the egg whites at medium speed. When the egg whites are frothy, increase the speed to high and start gradually adding the sugar. Keep beating until the egg whites are glossy and stiff. Pinch a bit of the meringue between your fingers. You shouldn't feel any grains of sugar. If you do, keep beating for a few minutes. Then fold in the vinegar, 1 teaspoon vanilla, and cornstarch. Place the meringue within the circle on the parchment paper. Spread to form a thick even disc. Place in the oven and bake for 55-65 minutes. The meringue should be pale ivory in color. If there are cracks in the meringue, that's fine - more room for the whipped cream! Turn off the oven, open the door a bit, and let cool for 1 hour. Remove from oven and move the meringue, still on the parchment paper, to a wire rack. Cool completely, then carefully run a large spatula under the meringue, loosening it from the paper. You can make this ahead of time and store, tightly covered, at room temperature up to 2 days. When ready to serve, combine cream, powdered sugar, and 1 teaspoon vanilla in a medium bowl. Beat until cream is stiff and thickened. 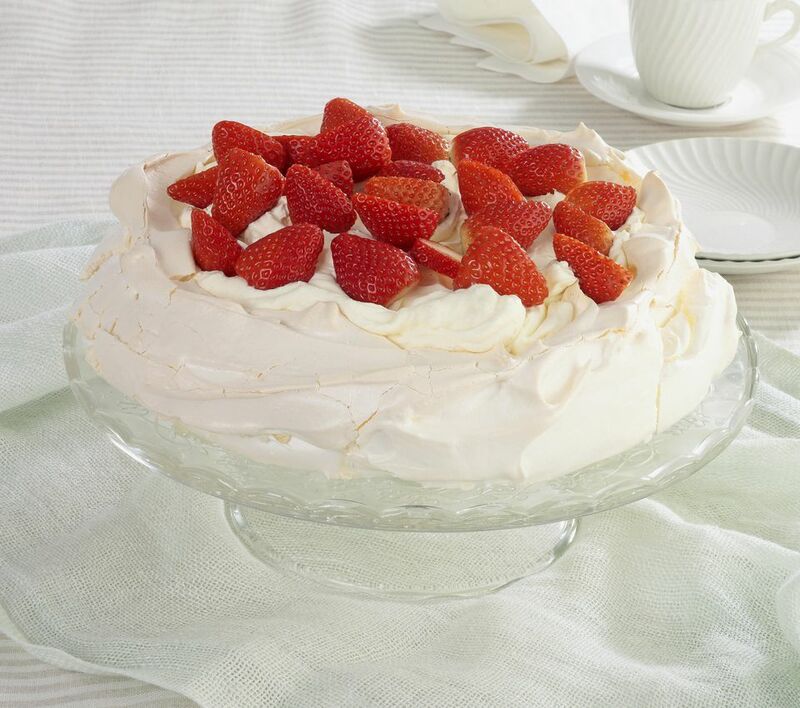 Pile the cream over the pavlova and top with the berries. Slice into wedges to serve.